Ran PCR starting with highest copy number of WS p16RK7 plasmid curve (from 20120731) due to lack of amplification of the 300 copy plasmid seen on 20130423. Master mix calcs are here. Ladder is Hyperladder V (Bioline). Lowest copy number visible is 3e4 copies (30,000 copies). Will run subsequent PCRs with copy numbers between 30,000 and 3,000 to identify lower limit of detection for this withering syndrome cPCR assay. Ran PCR to determine limit of detection using dilutions starting at 300 copies (the lowest detectable copy number shown on Nate’s poster). Ladder (Hyperladder V; Bioline) is loaded in furthest right lane. It is smeared due to a loading error by Sonja who loaded her sample in the same well as the ladder. No amplification. Will repeat with higher copy number plasmid templates. 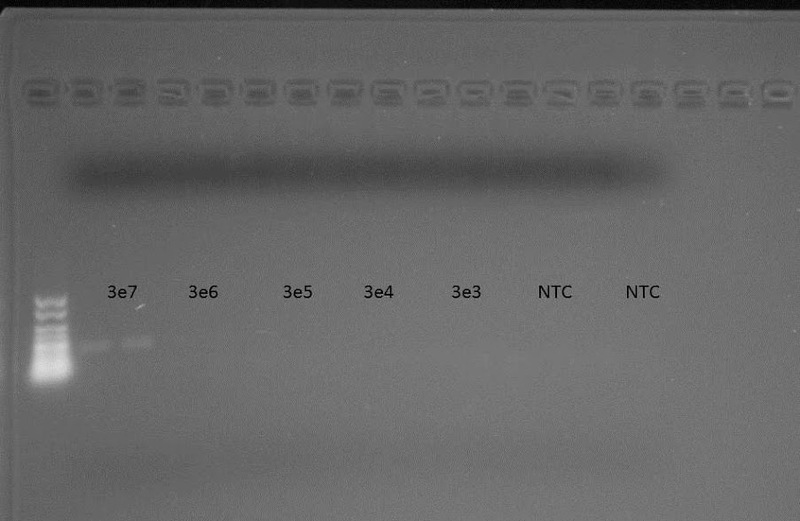 Ran PCR using fresh working stock of primers. Adjusted primer volumes being used. Recipe from Lisa (from the class) were only using 0.1uL of each primer per reaction. 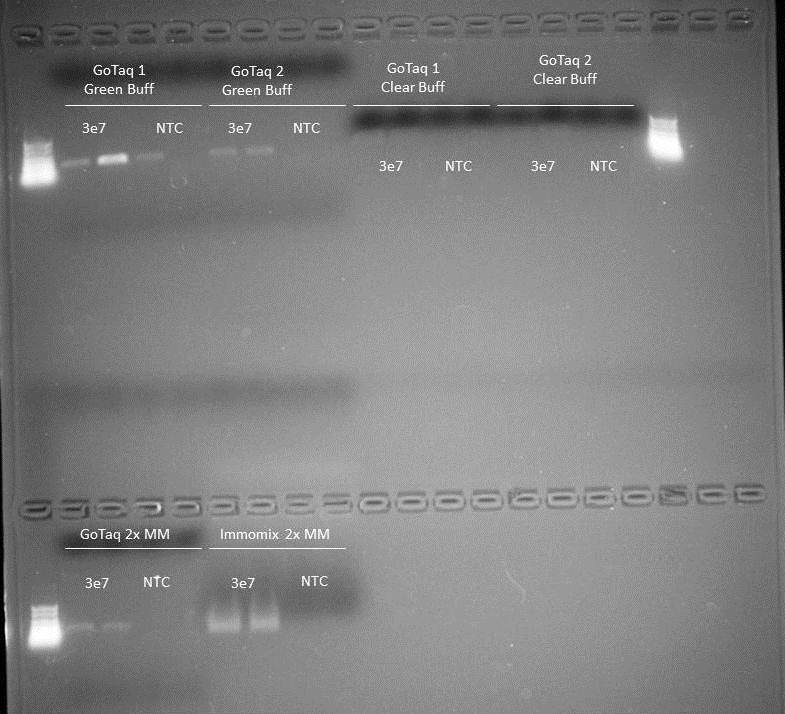 Also, tried additional template DNA to determine if the template I’ve been using has become degraded. Additional template were two other WS plasmid curves from 20120731; 3e7. Master mix calcs are here. Success!!!!! Unfortunately, I can’t say definitely if the previously used working stocks were bad or if the primer amount being used was too low (I suspect the latter), but it works and that’s all that matters. Will proceed with finding the limit of detection for this assay. Ran this WS cPCR using GoTaq and used a different aliquot of the RA primers working stocks. Another failure. And, another inconsistent run (i.e. duplicates aren’t the same). 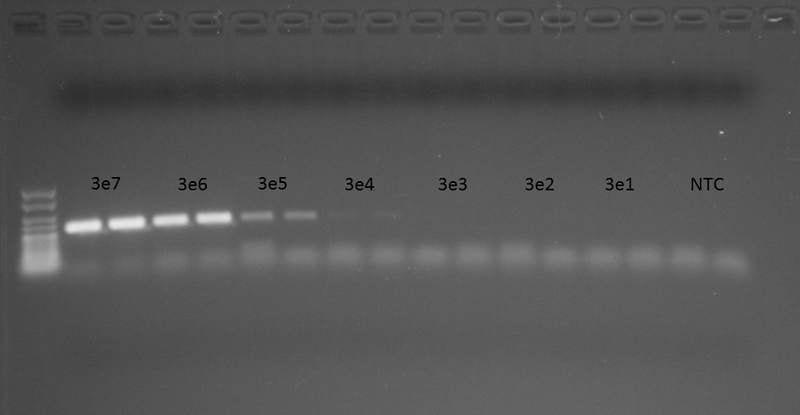 Regardless, band is too faint for using the 3e7 copy plasmid. Had been using RA primers that Lisa had from an old class. Maybe I should make new working stocks?? 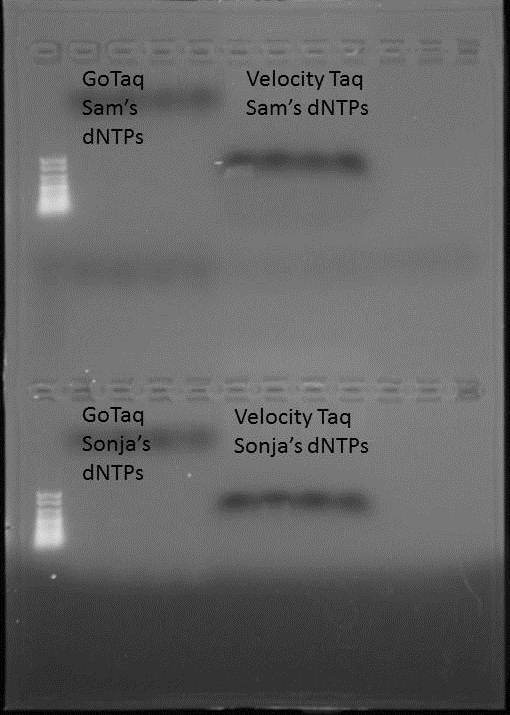 Ran PCR comparing GoTaq (Promega) and Velocity Taq (Bioline), while also comparing dNTPs (Bioline). Master mix calcs are here. All samples were run in duplicate. Used the 3e7 copies of the p16RK7 plasmid curve (from 20120731) as template. No amplification with either dNTP set using the newly purchased GoTaq. Oddly, it seems like there’s some amplification (inconsistent, at that) with the Velocity Taq, but the band produced is too large. Since this didn’t work, I guess I’ll try a new aliquot of the primer working stocks. All samples were run in duplicate, except the GoTaq 1 Green Buff, where I accidentally loaded the 3e7 template into three of the four wells. 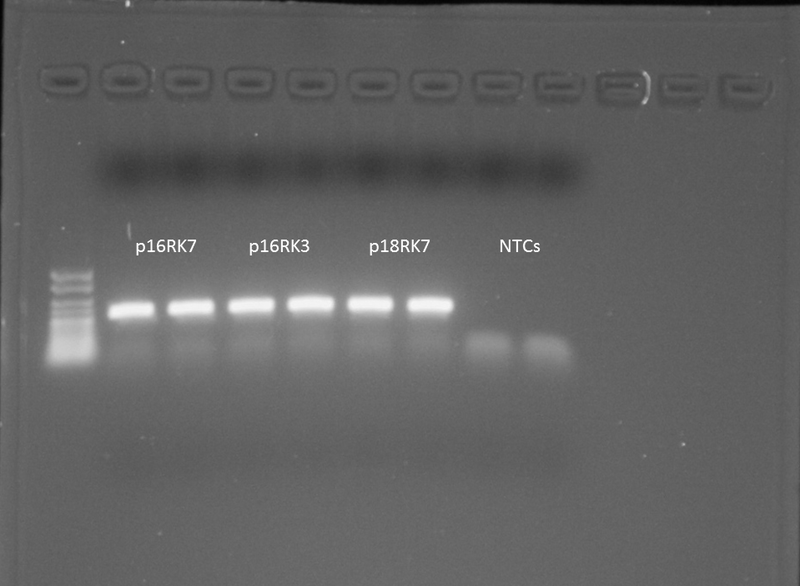 Repeated yesterday’s PCR, but utilized the p16RK7 plasmid curve (from 20120731) from 3e7 to 3e1. All samples run in duplicate. Ran cPCR, but used Promega GoTaq Flexi instead of the 2x Immomix Taq (Bioline). Master mix calcs are here. cPCR recipe was provided by Lisa. Great, no amplification of any sort. More troubleshooting??!! Will begin troubleshooting tomorrow. Ran cPCR, similar to that performed on 20130206, but with a lower set of dilutions, since the previous cPCR successfully detected down to 30 copies. A band is present in all samples, except the NTC. However, I’m frustrated by the appearance of the bands that these cPCRs are producing. I don’t like the smearing and looking at Nate’s poster outside of the lab, he has gel images with tight, very defined bands with no smearing. Will discuss with Lisa. However, it’s interesting that the cPCR seems to detect all the way down to 3 copies! This suggests that the qPCR and cPCR don’t exhibit any difference in their limits of detection. I find this a bit odd, but will wait until I speak with Lisa to see what she says about Nate’s gel images. UPDATE: Lisa indicated that the cPCRs are performed with different reagents/recipes than the qPCR! Will give those a shot to see if that improves the band quality.